Why in the World Do We Potty Train our Children? Spoiler alert! This post talks about pee and poop. Quite a bit. Just thought I should give you the head’s up:). A little before his second birthday our Jack started being very interested in the toilet. I knew he was aware when he was going to the bathroom so I figured he was ready to learn to go in the potty. Jack’s birthday is right after Christmas, so this year Santa brought him some new underwear and a new book called Potty by Leslie Patricelli. I looked forward to potty training him and only having one baby in diapers. A few months passed and Jack was still in diapers. But he loved reading his potty book and even started putting it on the back of the toilet. These things were exciting to Jack. He often wanted to wear his new underwear over his diaper, and not only one pair, but all six pairs of his new underwear. I figured Jack was so ready to do this. Just a couple of weeks ago, I read a post from one of my friends that she had just potty trained her little 22 month old girl in 3 days. 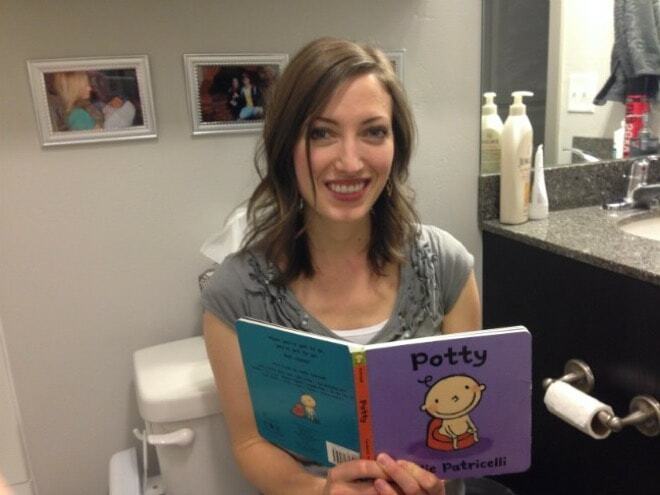 She used the 3 Day Potty Training method by Lora Jensen. Her post was inspiring to me and I thought that Jack would be potty trained in no time. So I blocked out 3 days earlier this week and decided we would give potty training a try. Monday morning I got ready for the day and we ate breakfast, then I let Jack pick out a pair of underwear and had him throw away his diapers. He wasn’t sure this was a good idea. Those 13 accidents counted for a lot of cleaning the carpet and hardwood floor. I felt like I had a puppy! Jack got a little frustrated and wanted to go back to diapers. I told him that we had thrown them away and he told me that he would just get them out of the garbage! He knew where he had put them and saw no problem in digging them out. He also knew he had a baby brother that still wore diapers and what would be the problem of borrowing one of his? I tried not to show my frustration throughout the day as I thought to myself that I would rather be changing diapers! I could honestly not think of ONE good reason that this was a good idea. Why in the world do we potty train our children?! And if my child was going to need to use the bathroom 13 times each day how was I ever going to go anywhere again? I already thought it was hard enough going to the store with two kids. Despite all of this, at the end of the day when daddy got home, Jack was excited to show him that he could use his potty step and his potty seat to go to the bathroom in the toilet. So he climbed right up there and went like he had been doing it all day! It was really exciting to see. This gave me a little hope and a little courage to think I might be able to try again the next day. He woke up wet in the morning. I went in and put him on the toilet. He said the same thing he had said all day the first day, “I don’t like to, I don’t have any more pee.” So I got him off again. This was around 6:30 in the morning. After that I kept asking him to tell me when he needed to go potty. Chandler left for work just after 7:00 a.m. and I knew Jack was going to need to go soon. I kept bringing it to his attention and telling him to keep his underwear dry and to tell me when he needed to go. I had just finished saying one of these two things to him and turned around for one second and the next thing I knew, there he was making a mess on the floor! Oh dear. I rushed him to the toilet and once he was sitting there he told me that he was going to poop. He said, “I need to read my potty book.” This made me wonder if he thought that every time you sit on the toilet you have a bowel movement. So I told him that this was not the case. However, he knew his body better than me because sure enough he just went in the toilet! I was so impressed! And I was so grateful for that potty book. Despite that early success, he had accidents the rest of the day, including at dinner. We had, perhaps unwisely, gone out for dinner (though I don’t know if I could have brought myself to fix dinner anyway after a second day of potty training), and while we were sitting there I looked over and could tell from his face that he was peeing. So we rushed him to the bathroom and then out to the car to change him into his spare clothes. And after, I did my best to sanitize the chair he had been sitting in. When we were home again and getting ready for bed, he did manage to pee in the toilet again, so at least that ended the day on another hopeful note. And similar to day one he would go pee in his underwear and then I put him on the toilet and he would end up going poop while reading his potty book. Amazing!Well day three ended and we were at a 50% success rate. So much for being trained in three days, right? I was worried. But Jack woke up dry on the fourth day. He ended up just getting his underwear a little wet and then going in the toilet. All of a sudden it seemed like he knew how to hold it. So we decided to venture out to watch a cousin’s softball game. Before leaving I sat him on the toilet, and he gave me his customary “I don’t like to go.” But after sitting there for just a couple of seconds he went like it was second nature. After we got to the ballpark I thought he had wet underwear so I was running around everywhere trying to get him into a bathroom. I got him in and he didn’t want to go but then I helped him sit on the toilet and right away he went. Managing to get him to use a public restroom at a ball complex seemed like a pretty triumphant moment in our potty training journey. After the ballgame we went home for naps, and he woke up wet. And it got worse before it got better. Up till then I had been lucky that if he ever needed to poop he was usually sitting on the toilet already after an accident, where he would sit and read his potty book until he was done. But that evening, while we were getting dinner ready, Jack said, “Mommy, I’m pooping.” And sure enough he was. Cleaning that up? DIS-GUS-TING. Today, the fifth day into it, he did pretty well. He used two unfamiliar toilets while we were out on day’s activities, and he didn’t have an accident until bedtime. First, why in the world do we potty train our children? Potty training is tough on kids. Jack had a hard week. He told me this himself numerous times. “I’m having a hard day, Mom.” “Hold me, Mom.” Saying this meant a lot coming from my boy who generally has so much work to do that he doesn’t have time for even a hug. I definitely tried to be understanding of what he was feeling during this week. His whole life was changing. This was a big deal for a little kid. Jack had been trained all his life to go in a diaper and suddenly I just expected him to go in the toilet? My experience reminded me about a friend of ours who said he had learned that children could be done with diapers between 8 and 18 months. This friend had once told me that he and his wife took their son to the toilet his first week, and when he was only 5 days old he went in the toilet. Once their son could sit up they let him sit on a little potty. When he could crawl he would crawl to the bathroom and knock on the door when he had to go. Seeing Jack be frustrated I’ve wondered if my friend’s way isn’t a better system? To teach your children where they are supposed to go from the beginning so they are not confused? But then you hear the stories from people like the happy house wife about just letting the kids decide when they are ready for underwear. And to me that sounds easier and much more pleasant than any alternative. I love being a mom and I am grateful to be the one to teach Jack how to go potty. He does show enormous excitement once he goes in the toilet. Mostly because he gets to have a sticker or some licorice. We are saving money by no longer buying diapers for Jack. We no longer have to wrestle him to lay on his back while changing his diaper. Thank goodness for a potty book, which helped Jack poop in the toilet (most of the time). Thank goodness for sisters and sisters-in-law who encourage and make sure you know you should reward yourself at the end of the week. Last but not least, thank goodness for moms who make sure we know all kids are different and that it is okay if mine doesn’t get it at the end of three days. Now that I’ve shared probably way TMI about my first potty training experience, I’d love to hear from you about your own experiences, as well as your thoughts on the whole ordeal!